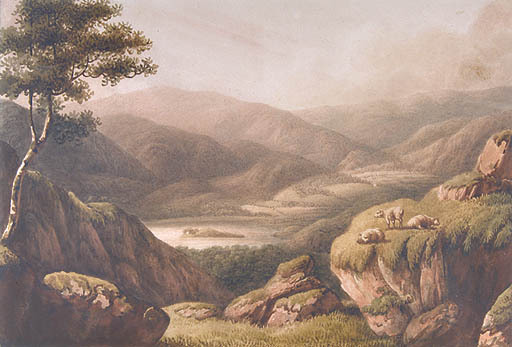 MS B is a full fair copy text for Home at Grasmere, made in 1806. It is used to pull together all previous manuscript materials: MS A, MS R and Prospectus MSS all feed into MS B. This version of the text is 1048 lines long and offers the fullest account of the poem before Wordsworth later decided to remove sections for publication elsewhere. In its material form the notebook consists of two gatherings of the same size, each comprising 3 blocks of 8 pages sewn together. The first forms the main body of the notebook (p.1-21 and 46-48) and is folded around the second inserted block of 3 gatherings of pages (22-45), enclosing them within it. 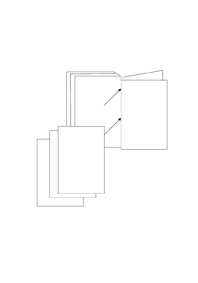 This divides the pages of the main body, leaving 3 final pages at the back, after the inserted block. The first block of work to be entered into MS B was copied from MS A and another missing manuscript. This filled most of the first section of the notebook, with MS A source material ending on 20r. An eleven line addition on 21r is added to the fair copy to connect MS A source material to MS R source material. The next section of the notebook from 21v-38r largely follows MS R, including tales of Grasmere villagers and ensuing reflections upon community. This block of work still seems to follow the breaks between blocks of entry in MS R, however, with the Grasmere narratives filling the first sewn-in gathering (22r-29v) and the reflective block of work beginning "No We are not alone" starting on 30r which is where the second sewn-in gathering begins. This copy then runs over into the third gathering (which begins on 38r). MS R source material for the fair copy comes to an end on 38r to be followed by the "Happy Band" passage and a further section (both of which have no surviving source manuscript), then the "Prospectus" lines, copied in from DC MS 24 and other related MS material, now missing. This material runs over the end of the sewn in gathering and onto the last pages of the first section of the notebook (46r-48v). Revision to the copy text as part of the completion of the poem for MS B. Revision to MS B in order to remove lines 469-606 for publication in The Excursion. After removal of Excursion material, new drafting in an attempt to rewrite the base text. Revision relating to the creation of the second fair copy text: MS D.